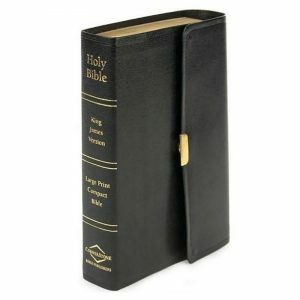 The Holman Large Print Compact Bible slips nicely into a coat pocket, briefcase, or purse. Features include 8.25 type, words of Christ in red, 52-week reading plan, eight four-color maps, concise concordance, ribbon marker, gift box, and more. Black bonded leather edition with snap flap closure.